Aishwarya Publications Pvt. 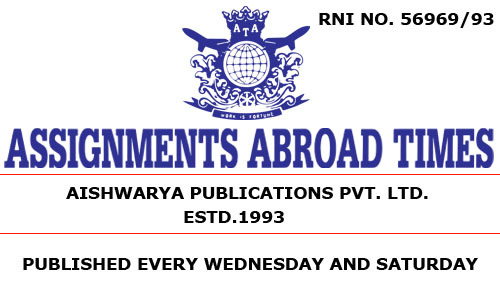 Ltd., publishers of Assignments Abroad Times, a publishing house established in the year 1993 with an intention to publish exclusive publications. It was the time manpower exporters from India were struggling to source the requirements of their principals. They had to place ads in vernacular dailies with limited reach, as many semi-skilled and skilled persons do not read an English daily. This weakness of the industry was exploited by some people by projecting themselves as sub-agents supplying candidates to manpower exporters. The result: Many job seekers and manpower exporters land in trouble, besides severe financial losses. Aishwarya Publications Pvt. Ltd. has conducted a thorough survey of the industry and felt the need for starting a weekly newspaper exclusively for the manpower export industry. Thus was born Assignments Abroad Times. The dream of manpower exporters and overseas job seekers has come true. It was really a revolution. A newspaper for the most neglected sector! The response from the advertisers and respondents was overwhelming for the paper, published on Saturdays. It has grown up as an exclusive weekly newspaper having an all India presence. And the dream run started. That was only a beginning. The patrons of Assignments Abroad Times, both the readers and advertisers, expressed their wish to have another edition of the paper as they had to wait for whole week for the issue to come. We also felt that it was the time to make Assignments Abroad Times a bi-weekly. And AAT started bringing out the second edition on Wednesdays. Another major sector Aishwarya Publications identified as one that requires exclusive attention is the placement sector in India. The necessity of an exclusive newspaper to function as a co-ordinator between the employers and candidates is an absolute necessity. The corporates-both Indian and multi-national-find it difficult to get the suitable candidates, while on the other side the best candidates were left in the lurch. And Aishwarya Publications have decided to solve the problem by launching a newspaper christened 'vacancies for you, another successful story that Aishwarya has in its credit.